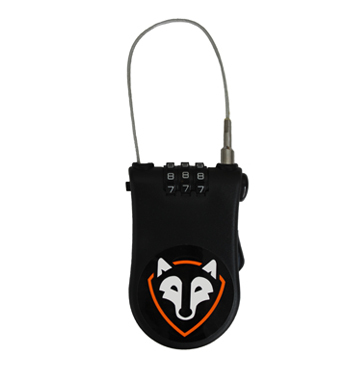 The Rightline Gear Security Cable Lock comes with the pre-set combination (0-0-0). You may reset this combination to your own personal combination code. Make sure you choose a code that you can easily remember because if the combination is forgotten, the lock cannot be used or reset. To ensure a trouble-free experience, please read through the directions before attempting to set the lock’s combination. Feel free to contact us before getting started. Align the pre-set combination (0-0-0) across the top of the lock. Press the cable trigger located mid-way down the right side to make sure the cable is fully retracted. Push in and hold the small reset button on the top left side by the cable head. As you continue to hold the reset button, set the dials to your new combination. Release the small reset button and your new combination will be set. WARNING: Beware of accidental combination change. You will not be able to use or reset the lock if you do not know the current combination. Align your combination across the top of the lock. Press the cable trigger located mid-way down the right side and pull out your desired length of cable. Push in and hold the lock button on the top right side by the cable hole. Insert the cable head into the cable hole and release the lock button. Press the cable trigger to remove any slack in the cable. Press the lock button and pull out the cable from the cable hole. 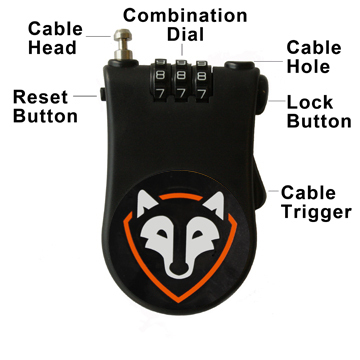 Press the cable trigger to retract the cable into the lock&apos;s body. 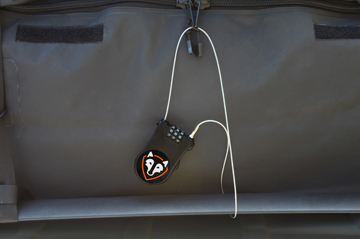 Use the Car Top Carrier Cable Lock to go through the zipper pulls of a car top carrier bag and loop around the rooftop luggage rack.